The authors speak, present workshops, and provide customized training programs for large and small groups. For pricing or more information contact them by email or at 617-621-7009. Elder Decisions® will offer a 3-day Advanced Elder and Adult Family Mediation Training in the spring of 2018 in Newton, MA. Crystal Thorpe led two workshops on October 9, 2014, at the ACR 2014 Annual Conference in Cincinnati, Ohio – entitled Elder / Adult Family Mediation – Challenges and Opportunities and Elder Mediation Story Swap. She also participated as part of a panel on Ethical Considerations for the Work We Do, held October 11th at the Elder Decision-Making & Advanced Practitioner Family Mediators’ Retreat, following the conference. Arline Kardasis was the featured presenter at the 5th Annual Vermont Elder Law Summit of the Vermont Chapter of the National Academy of Elder Law Attorneys – held on October 10, 2014 at Vermont Law School in South Royalton, VT. Crystal Thorpe presented a workshop titled Using Mediation to Resolve Elder/ Adult Family Disputes at the NASW Massachusetts Chapter Symposium 2014 on April 4, 2014 in Framingham, MA. Crystal Thorpe presented on Resolving Family Disputes at Foxmoor Continuing Education’s Mass Health Update 2013, featuring Harry Margolis and William Brisk, held on October 25, 2013 in Waltham, MA. Arline Kardasis presented a workshop titled Elder/Adult Family Mediation – Setting the Table for Success at the Association for Conflict Resolution (ACR) 2013 Annual Conference, held October 9-11, 2013 in Minneapolis, MN. Arline Kardasis and Crystal Thorpe presented a workshop titled An Adult Family Case Study: An Insider’s View at the Second Annual Conference of the Academy of Professional Family Mediators – “Mediating in the Landscape of the Changing Family” – held October 3-6, 2013 in Denver, Colorado. Arline Kardasis was a guest on The Texas Conflict Coach® Blog Talk Radio program on September 17, 2013 with guest host Zena Zumeta in the program: Got Conflict around Eldercare and Estate Issues? Here’s a Guide for Resolution! Crystal Thorpe presented a workshop titled Communication when Connection is Lacking: Bringing adult family members to the table in the growing field of elder mediation at the Regional Conference of the New England Chapter of the Association for Conflict Resolution – “Conflict, Communication and Connectivity: Navigating New Terrain in the Digital Age” – held June 14, 2013 in Sturbridge, MA. Crystal Thorpe co-presented a workshop on Sharing the Pie: Estate Planning Conflicts and Recipes for Resolution for the Massachusetts Council on Family Mediation on December 12, 2012, in Wellesley, MA. Arline Kardasis and Crystal Thorpe presented a workshop on Elder & Adult Family Mediation – Completing the Circle of Family Mediation Practice at the Founding Conference of the Academy of Professional Family Mediators on September 28, 2012, on Cape Cod, MA. Arline Kardasis presented An Introduction to Elder & Adult Family Mediation at the April 18, 2012 meeting of the Rhode Island Mediators Association, held at Roger Williams University. Click for details. Crystal Thorpe participated in a panel on Financial and Estate Planning as part of the “Aging in Weston” Symposium at the Weston Council on Aging on April 10, 2012. She discussed how to use the mediation process as a tool for productive family meetings. Arline Kardasis presented a webinar for the National Association of Professional Geriatric Care Managers on March 7, 2012, titled “Using Mediation with High Conflict Families.” She shared her experiences as an Elder Mediator who has helped adult family members reach consensus on some of the most difficult decisions they have ever faced together. Arline Kardasis was the lead trainer at a two-day Advanced Elder Mediation Training hosted by The Mediation Training Group in Boca Raton, Florida on December 12 & 13, 2011. Arline Kardasis and Crystal Thorpe provided a 5 hour CEU program on Conflict Resolution Skills Training for Eldercare Professionals: Working with Families in Conflict on November 30, 2011 at the Plymouth Council on Aging. For more information, view flyer. Crystal Thorpe shared her experiences as a mediator working with families in conflict, and offered some tips about what people can do in their own families to bring about more collaborative decision-making, on November 17, 2011 at the Auburn Public Library in Auburn, Maine. 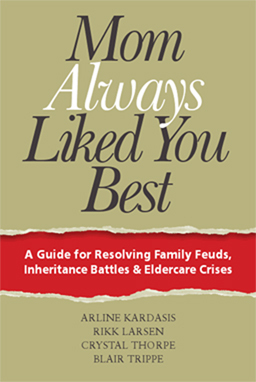 Arline Kardasis shared strategies for resolving adult family conflict from the book at NewBridge on the Charles Assisted Living on November 15, 2011. Her talk – “Using Family Mediation to Resolve Family Feuds, Inheritance Battles & Eldercare Crises” – was part of the three-part series “Aging: Talking About the Tough Stuff.” This event was sponsored by HouseWorks, Jewish Family and Children’s Services, and NewBridge on the Charles. Blair Trippe spoke on Managing Family Transitions and Conflict at the Kellogg Speaker Series on November 15, 2011, at the Elephant & Castle in Boston. Arline Kardasis participated in a panel discussion presented by Bayada Healthcare at the JCC Newton on November 3, 2011. Crystal Thorpe presented a workshop for residents and family members at Fuller Village in Milton on November 2, 2011. The program was co-sponsored by Partners HealthCare at Home. Blair Trippe discussed methods participants could use to help family members and/or clients resolve adult family conflicts at the law offices of Margolis & Bloom, LLP in Boston on October 3, 2011. Rikk Larsen and Blair Trippe were featured guests on the nationally syndicated CBS radio show NightSide with Dan Rea on September 30, 2011 from 10:00-11:00 PM. The show is broadcast live in 38 states and several Canadian provinces. Crystal Thorpe and Blair Trippe led a Roundtable Discussion of the book at Mediation Works Incorporated in Boston on September 21, 2011. Crystal and Blair addressed the types of issues adult siblings grapple with as their parents age, the reasons families get stuck, and how they can move forward. They discussed the landscape of Elder & Adult Family conflict, why it is so challenging, and some tools mediators can use to help family members make decisions and overcome impasse. Crystal Thorpe was the Keynote Speaker at the HESSCO Caregiver Day of Resources and Relaxation held on September 20, 2011 at Four Points by Sheraton in Norwood. Her presentation was entitled “Getting to the Heart of the Matter: Managing Difficult Decisions.” For more information, visit HESSCO.org. Blair Trippe and Rikk Larsen were interviewed about the book on the WGBH television show, Greater Boston with Emily Rooney. The program aired on August 1, 2011. You may view the interview at WGBH.org. Your educational offerings look wonderful. I am looking for some online ceu opportunities for social workers and RN’s. Do you offer any? Thanks for your interest in our programs. While we don’t currently have online CEU programs scheduled, our authors have done some teleseminars and webinars in the past and we’ll keep you posted of future such offerings.